Your pool is a great place to go for some fun and relaxation, but did you know that you can also get a lot of good workouts in while you’re enjoying the warm water, the fresh air, and the sunshine? Believe it or not, working out in your pool could be just the ticket you need to the leaner and more toned body you have always wanted. The reason that pool exercises work so wonderfully is because of the extra resistance the water provides on your body. At the same time, though, the buoyancy that you get while in the water provides extra support to your bones and joints, which you simply don’t get while working out on land. To take your workout routine to a whole new level, implement the following exercises while spending time in the pool this summer. 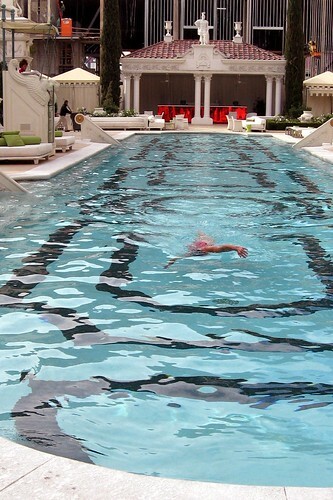 Of course, one of the first exercises that people think of when it comes to working out in a pool is swimming laps. This really is a great way to get your heart rate up, strengthen your respiratory system, and also work just about every muscle group in your body, from your back and chest to your arms and legs. Therefore, rather than just floating along while in the water, swim a few laps up and down your pool in order to get the blood pumping. Take breaks in between if you need to, but make it a point to also do a little more each day in order to slowly improve your endurance. Before you know it, you’ll be swimming more laps than you thought possible. And it doesn’t really matter what technique you use or whether or not you know how to do the various strokes that professional swimmers do. Just go with the flow and see how quickly your body improves. You can buy weights that are made specifically for the pool. From dumbbells to ankle weights, go to your local sporting goods store and see what you can find to increase the resistance while in the water. Ankle weights can be worn as you swim, but you can do stationary exercises with special dumbbells made with foam that will survive the water and provide you with just enough resistance to really build up your muscles. Everyone wants to have stronger abdominals, but not everyone knows that you can work on them while in the pool. If you own one of those great noodles that are popular for floating around in the water or playing with your kids, utilize it instead to hold you up in the deep end of your pool. Extend your legs straight down with your toes pointed and your feet together and then lift using your abs until your knees are bent at 90 degrees, and then repeat. Exercising in the pool is a great way to get in shape. If you already love to swim, all you need to do is add a few more pool-specific exercises to your routine to really improve upon the results that you see. Today’s feature author, Derek Tyler, is an architect who is currently working with B-Rod Pools, a company that offers swimming pool services in Greenwich. He enjoys listening to music and he also loves to play the guitar.